WhatsApp for Android Brings Two Steps verification: How To Enable WhatsApp is already rolling out lots of new features. Recently we have seen WhatsApp launched video calling feature for beta users of Android. Now, WhatsApp is rolling out two-factor authentication for Android users. 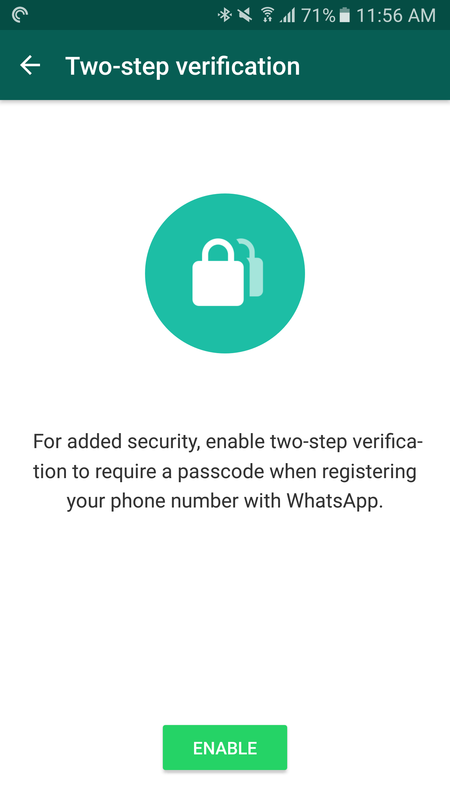 The two-factor authentication feature them in the latest beta version of WhatsApp app (2.16.341 and above). According to Android Police, the function has also been spotted on the Windows Phone beta. This two-factor authentication function prompts the user for a static six-digit password every time you register a new phone to the existing account. This feature is useful because it can provide defense against criminals who might try to clone your phone. Earlier SMS confirmation was the only way to register the existing WhatsApp account new device and SMS can register all devices are sent to your phone. Therefore, two-factor authentication provides a critical line of defense against criminals. To enable two-factor authentication, users need to sign up for a beta version of the Google Play Store. Open WhatsApp page in the Google Play Store and keep scrolling down and you will tap an option "Logging in the tester" to "I am" and wait to find a few minutes. Step 2.Now Click "Two-Step verification" and tap "Enable"